While many birdwatchers think of the Blackcap as a summer visitor, for garden birdwatchers the species is more commonly encountered in winter. In fact, numbers using gardens during winter are rising rapidly, both reflecting and fuelling a profound change in the migratory habits of this bird. Elegant, feisty and with a liking for town and city life, the Blackcap is a visitor not to be missed. A growing number of Blackcaps that breed in central Europe are coming to our shores to spend the winter instead of travelling to the Mediterranean, where they normally go. In Britain, food provided in gardens, coupled with our warming winter climate, is helping Blackcaps to survive. The reward for enduring harsher winter conditions here, rather than in the Mediterranean, is that our Blackcaps have a shorter journey back to central Europe in the spring, meaning that they can stake an early claim for the best territories. 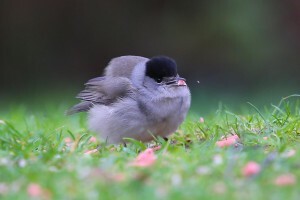 Central European breeding Blackcaps that winter with us have been found to lay more eggs and fledge more chicks than those that winter further south. Gardens in the west of Britain including Scotland are particularly favoured by Blackcaps during winter, owing to the milder conditions in this area. Mildest of all is south-west England, where Blackcap visitations exceed those of any other region. Despite the south-western bias to their wintering range, householders just about anywhere, can look out for Blackcaps.